← Building Amazing Homes & Mobile Spaces Using Shipping Containers! Here are some guidelines for gray water use: never use for direct consumption; don’t use directly on anything that might be eaten; don’t spray it; never reuse water from washing diapers or cleaning meat or poultry; occasionally water plants with fresh water as well to leach away any buildup of toxins, and use biodegradable soap. Because of continuing drought, California legalized the use of gray water in 1992. However, it was only legalized for subsurface use, either with drip systems or mini-leach systems. Drip systems require the use of a surge tank to clarify the water, where leach systems may use the gray water directly. In either case the water must be introduced at least eight inches below the surface. 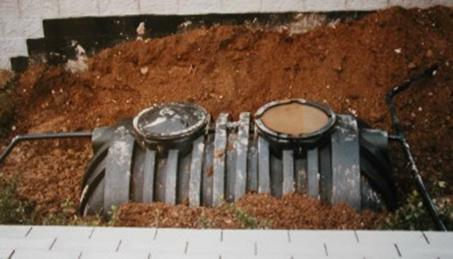 This below-ground cistern is being installed to store rain water. 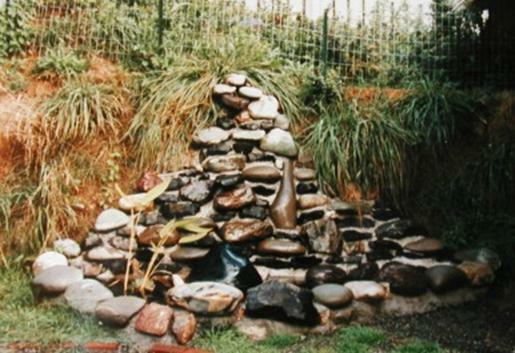 The above photo shows a little water fall and pond arrangement that was where the overflow water from the cistern pictured earlier discharged. Sometimes water is captured from paved areas, and that is best used for watering plants. A considerable amount of water is typically used for watering landscaping, especially lawns. It takes about 660 gallons of water to put one inch of water on 1,000 square feet of lawn. When my wife and I were living in a bus conversion motor home, we managed to accommodate all of our domestic water needs (including showering) on about 20 gallons a day, so that bit of lawn watering would have provided us with about a month’s worth of water! If you must have a lawn, just water when it really needs it, or better yet, let it go brown during the dry season. Other strategies for diminishing outside water use include mulching plants, using drip irrigation or soaker hoses and planting indigenous, drought-resistant plants. 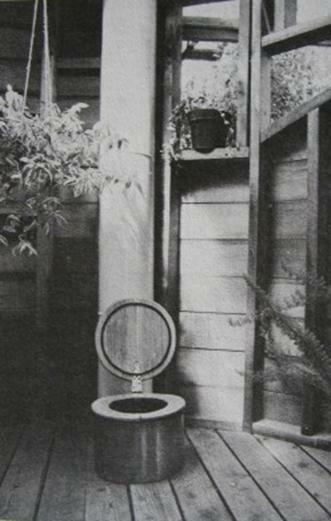 Now comes the touchy subject of compost toilets. People either love the idea or hate it; I’m somewhere in between. My wife and I have lived with a compost toilet on several occasions, so I can speak from experience. 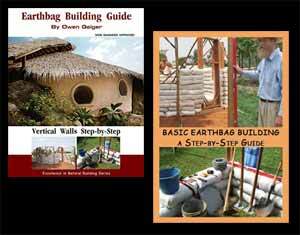 The first one we used I built copying the design of the Swedish Clivus Multrum system, and we used it for a few years. It’s a pretty clever, low maintenance design, where the waste material slowly slides downhill so that the finished compost is available at the bottom of the tank. A network of pipes provide air to the composting mass to assure aerobic decomposition, and a large insulated vent stack carries any fumes outside the building. It actually worked pretty well, but occasionally flies would set up camp in there and that was a problem. Also periodically cleaning the thing out was no fun. The next composting toilet we used I installed in our bus. It was a commercially made Sun-Mar boat and RV toilet. It also worked, but we had two major problems: the fly situation became intense at times, and unfortunately the capacity of the collection drum was not great enough for the two of us using it full time. Thus I had to clean out the tank before the waste material was fully composted; that was really no fun! So if you’re interested in pursuing a composting toilet, I suggest that you carefully size it to your needs, and be prepared to deal with the very organic nature of it. If you are good at keeping a garden compost pile cooking along, you might enjoy using a composting toilet. Water conservation is partly a matter of consciousness and partly a matter of having appropriate systems. It is obvious that we can get by with a lot less water than we typically use, so why not start using less now and be prepared for possible shortfalls? Vermicomposting flush toilets are a nice compromise. No flies, no cleaning or handling. Pretty much a septic tank with worms. Never needs to be pumped. You can get creative with the flush water.